We are well into Lent now, and I wonder how many of you have given something up? Fasting is an ancient tradition, not just in Christianity. It is, though, paired with feasting – and after a fast there is usually a feast. So it is about harmony and balance. In our case in this month, Easter follows Lent, but I have also enjoyed the breaking of fast at sunset during Ramadan with Muslim friends. I always think, though, that the Christian tradition in this part of the world is particularly in harmony with nature. Lent falls at a time when, in the days before freezing and imports, there really wasn’t much food around anyway. The meat slaughtered in autumn and over Christmas was finished, the stored apples and pears were used up, nothing much was growing in the fields yet. So fasting seems like something people didn’t have much choice about! However, for country people it wasn’t quite as bad as you might think. At the end of February and during March, many wild green plants have come into leaf. And most of these are edible. All over the country there are old recipes for “Lenten pudding” made from suet pastry with various wild greens rolled into it. One, in the north of England, was called “dock pudding”. This was made with a relative of the dock called bistort. It’s not common round here but grows in St Laurence churchyard and Sandhills Green, probably introduced rather than wild. Foraging for green stuff has become quite common again now, even trendy, and really fills the gap before the garden vegetables grow. Like all foraging, you need to know what you are doing. You can go on guided foraging walks, or read up on it in books like the classic Food for Free by Richard Mabey. However, books sometimes don’t help identify plants exactly, so learning about where a plant grows, when its leaves come, what it smells and tastes like are important too. Don’t eat anything you aren’t sure about! You should also only pick leaves in the wild in places where you have legal access – waysides and footpaths. Don’t pick in parks or reserves, and only pick things that are plentiful, taking just enough for yourself. At this time of year, I will eat anything that smells of garlic! The common wild garlic, or ramsons, is very easy to identify by its smell. It has broad, strap-like leaves and later, in April, a starry white cluster of flowers. You can use the young leaves in salads or in cooked dishes where they add a mild garlic flavour. I have the less common Cornish garlic in my garden – it is very common in Cornwall of course. This has distinctive three-cornered leaves, which begin to appear very early, often in February, and its flowers are pretty white bells. Later, when the flowers come on both varieties, these are lovely in salads or sprinkled on vegetables. There is a rarer one that grows in Old Birmingham Road, Alvechurch: the few-flowered garlic. I wouldn’t pick this, as it is not common. Garlic leaves are used to wrap a form of cheese (garlic yarg) and are a wonderful addition to omelettes and quiches – perfect meat-free dishes for Lent. If you aren’t sure what they look like, visit The Meadows in Alvechurch in March or April and look at the boardwalked area by the river – but don’t pick it there! It grows in woods, and often shows where there are remnants of old woodland. I don’t know why people think of garlic as being “foreign” food, as it was eaten here certainly as far back as Chaucer’s day. It is very good for you and has antiseptic properties. Also tasting of garlic is the garlic-mustard or jack-by-the-hedge. This has a head of little white flowers and rounded toothed leaves which smell strongly of garlic when crushed. Both flowers and leaves are edible and delicious in salads when young. Stinging nettles are also lovely when young, full of vitamins and minerals – but make sure you cook them. Nettle soup is traditional, often with oatmeal and wild garlic. You can use white or red dead nettles in the same way too. The most common edible plant at this time is cow parsley. It tastes like parsley, of course, and is lovely chopped in salads and soups. However, it’s often recommended not to eat it, because it looks very like other members of its family which are poisonous! 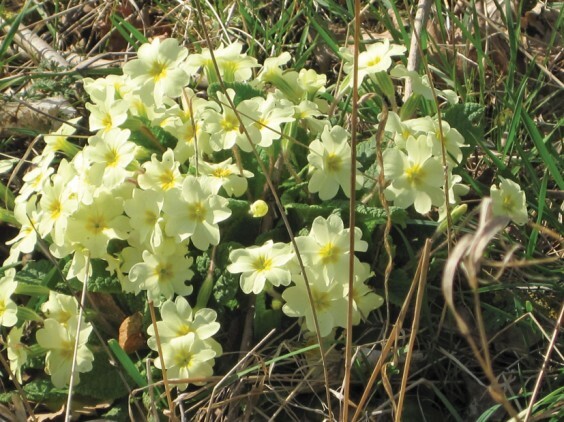 It is easy if you know it, because it is recognisable as a flower, so you can remember where it grows, and it is the only member of its family that is well in leaf in February and March (even January usually). The poisonous relatives are hemlock and hemlock water dropwort, both of which come into leaf later. Hemlock has a very different coloured stem, and hemlock water dropwort grows on the water’s edge and looks a bit like celery. Don’t eat these! You probably have another of our edible leaves in your garden: dandelions. The young leaves are delicious, and in France they make a classic dish fried with bacon (pissenlit au lard). They are highly nutritious and can form part of “Gardener’s Revenge”, my family’s name for a mixture of wild leaves which can feed you instead of being weedkilled. Ground elder is another one – this is an old herb, also called goutweed, and the young leaves are delicious. Chickweed is edible too, and was formerly fed to chickens as well as humans. Even the sticky goose-grass (another old poultry food) is edible cooked. Another weed that drives gardeners mad is the hairy bittercress, that tight rosette of little leaves with a tiny white flower that seems to get everywhere. It has a lovely peppery taste, a bit like rocket. A more unusual plant, though common in wet places round here, is the golden saxifrage. This has golden flowers that look like leaves among greener leaves. It grows under the little aqueduct on the Salt Way footpath, and is delicious in salads. There are lots of wild herbs too – one common in March is ground ivy, a head of small blue flowers which we used to make a tea from as children. Of course, we shouldn’t be surprised that we can eat all of these, as our cultivated vegetables came from them. In the cabbage family are wild mustards, wild rocket, wild radish, sea kale, sea beet and wild cabbage; in the carrot family are wild carrot, wild parsnip, parsleys and angelica. And don’t forget the leaves of trees. Hawthorn will be well in leaf by now, and used to be called “bread and cheese” because it fed hungry families in these lean times. Lime leaves are also delicious. It’s odd to think that in pre-industrial times country people probably ate a wider variety of vegetables than many people do today. As you can see, you could get your “five a day” from wild leaves. However, five a day is only an easily-remembered phrase saying that you should eat a variety of vegetables and fruit every day. Eating five bananas a day wouldn’t help much. In fact, the government hoped the five-a-day message would help our vegetable farmers as well as our health, but it hasn’t much. Too many people just eat fruit for their five a day, and most of the year this is imported. In fact, fruit is the least good choice, being high in sugar; a mixture of different-coloured vegetables is much better. The colours themselves aren’t the point, but they illustrate a range of nutrients: green vegetables having certain minerals and vitamins, red vegetables different ones and so on. So, the wild green leaves can be your green vegetables, but you also need to eat some roots and flowers too. Farmers’ markets – or your own garden – will have locally grown broccoli or cauliflowers, carrots, beetroot, turnips and celeriac to complete the range. It’s a pity there isn’t much vegetable-growing in the immediate locality – the great prison shop at Hewell shows it can be done. But we’re not far from the Evesham area, and a short drive past the supermarket will take you to a number of farm shops with genuinely local vegetables. If you haven’t been lucky enough to get one of the new allotments in Alvechurch and haven’t got a big garden, you can grow interesting veg in big bags of compost. This would preferably be your own compost – I make enough from kitchen and garden waste for this – but if not, remember to buy peat-free compost. Commercial peat-stripping has ruined the ecosystems of some of our wetlands – different from the small-scale use of peat as a fuel in Ireland and Scotland. At this time of year we can have our first English “fruit”, though it isn’t really a fruit, of course, but a stem: rhubarb. You can get forced Yorkshire rhubarb from January onwards and in the spring the first local stuff. It’s good in savoury dishes – especially with oily fish like herring and mackerel, or with pork – as well as puddings. I am diabetic and don’t use added sugar, but rhubarb is one of the rare things I have to use artificial sweetener for, as I can’t resist it! We all have it in Withybed, mostly passed on from the garden of one of our best growers. Why not layer your cooked rhubarb with English low-fat yogurt and toasted local oatflakes to make a healthy pudding – then scatter some white and purple violets, cherry-plum or blackthorn flowers, or primroses on top? White violets are common round here in March and taste lovely; if you do the Village Calendar walk for this month you should find some. You can also eat the flowers of all the leaf-plants described above – just keep the garlic ones for salads, not puddings! I hope I haven’t made the Lenten fast sound too much of a pleasure – but the abundance of green things in our locality is something to be celebrated. And, if you have been concerned over recent revelations about what is in manufactured processed food (of which horsemeat is probably the least unnatural!) you can at least recognise a vegetable for what it is, and know what you’re getting. The poem is one I wrote last November to celebrate the centenary of my mother’s birth. She taught me a lot of what I know about plants. You touch bramley and russet, knowing better. You tell the trees, and they bow down with fruit. Before the lean months of tinned peaches. Sweet purple grapes and, once, disastrous wine. But more often rotted by sea-mist and drizzle. Forming, but I don’t remember eating them. With chocolate blancmange from the packet. Standing greenly in the shelter, banana-less. Appleseed scattered across the century.